Most parents are familiar with biology, chemistry, and physics. I like to think of physical science as a bridge to these courses. 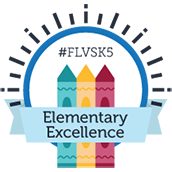 In the Physical Science course at FLVS, we take the concepts that students have learned from previous science experiences and prepare them for the higher-level science skills needed in future science courses and beyond. 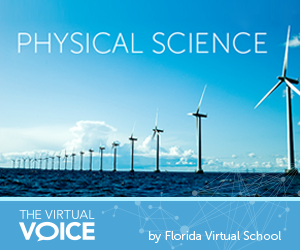 The Florida Virtual School Physical Science course offers interactive activities and virtual labs to help students build science confidence. The course nurtures the science literacy the current generation will need to fix our next set of problems as a society. The first part of the Physical Science course empowers you to find Newton’s Laws of Motion in everyday experiences – like the crack of a bat, the steep climb of a roller coaster, and the safety design of car seat belts. We give you the opportunity to be creative and make a Rube Goldberg device at home while exploring energy. 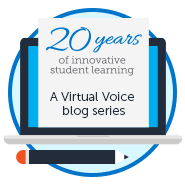 Many students list this as their favorite experience as they create videos and code programs. You will debate other students through collaborative opportunities to decide which waves of light are the most important to our society; research the sources of electricity and discover how light and sound waves are used in future career choices and in technologies you see on the news like Doppler radar; and explore data regarding environmental impacts. And that’s all just in Segment 1! By the end of the first segment, you’ll be better prepared for the world of forces, vectors, and optics in physics. In Segment 2, we dive into the chemistry side of things and cultivate deeper abstract thought. We help you explore new presentation tools to present your research. You’ll gain an appreciation of the beauty, amazement, and symmetry of the periodic table and explore how the atomic model has evolved right along with innovation and technology through the course of history. Enjoy a safe and mess-free way of testing the pH of substances around your home and examine the physical and chemical properties of acids and bases to identify other substances around you. You will also dig into ways everyone in our world can help prevent the damage we see from acid rain on buildings, ecosystems, and ourselves. We take a look at the amazing properties of water and the way it defies gravity and acts differently than other known substances to sustain life. You will research the growing field of biotechnology and how it is affecting your life now and how it will continue to affect your life in the future – including things like stem cells, vaccines, GMOs, crime science investigation, and gene therapy. The Physical Science course at FLVS connects you to science skills you will use throughout your life and gives you a deeper understanding of science. Our instructional team will help you understand the processes behind scientific discovery to dispel the pseudoscience you’re exposed to in a world of constant information feed. Our teachers love to share the science of the world around you. Check out a few of our students’ projects below and join us! This entry was posted in Homeschool Edition, Parent Edition and tagged course tour, Energy, Physical Science, Rube Goldberg machine, Science, STEM, student projects, Teachers, Videos on April 2, 2015 by Guest Blogger.